Most people have Christmas cactus, right? Well, here at the public library we have a Halloween cactus. It’s beautiful, even if it is confused about when it’s supposed to bloom. Yeah, mine is doing the same thing. I think it’s the shorter days cooler nights trigger as mine was outside until just a week or two ago. Must not really be temps though if this one was indoors- maybe it’s strictly a light trigger or lack thereof. 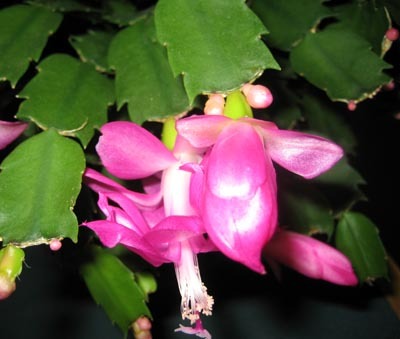 Hmmm…I have a white Christmas Cactus that is also in bloom. It is beautiful! My sister brought the mother-plant to me from New Orleans many years ago. Never thought of it being a “Halloween cactus” until your post 🙂 but it always blooms early. Lovely! Mine is the same color and blooms at Thanksgiving. Right now it is covered with tiny buds and if the little one in my house can keep his fingers off them I’ll take a photo once it blooms. I love Christmas cacti! My mom has had them forever — she has one that is always a Thanksgiving cactus, but I don’t think she has a Hallowe’en cactus. 🙂 I did not inherit her green thumb, but my brother did, and he has Thanksgiving and Christmas cacti too! It’s beautiful, even if it is confused! It’s beautiful, despite being confused! It’s just special and beautiful. Very pretty despite the confusion! Love the quilt you helped work on too — I’ve a niggling in my head about quilting and think there will definitely be some in my future. Some people call those Easter cacti. I think the cactus is fine, it’s the rest of us who are confused. Very pretty, even if it can’t tell time. You’re looks great! Look at all those blooms-in-waiting! We called ours Jesus because it always bloomed on Easter Sunday – no matter when Easter was! He developed root rot and is currently undergoing a procedure to try and resurrect himself into many new plants. He’s been in my husband’s family for 90 years. At least yours blooms. Mine hasn’t had a flower in YEARS . . . I saw a bud about two years ago, but . . . other than that . . . in the life of a houseplant, it’s been eons. My mom had one for years and years that never bloomed. Not once. mine blooms at thanksgiving and keeps on blooming until easter! It’s confussed, but it is lovey! mine blooms at thanksgiving and keeps on blooming until easter! It’s confussed, but it is lovely! Oh, I love Halloween/Thanksgiving/Christmas/Easter cacti! My mother had a huge one for years, and when she moved into an apartment it came to me. But I eventually killed it; I have killed an embarrassing number of such cacti. Enjoy yours, and thanks for sharing! Beautiful! Mine doesn’t bloom til after te new year, but it’s still a young clipping yet. Gorgeous. I don’t have a Christmas cactus, and I’ve always wanted one. I guess I should look for one. Pretty cool! Have a great weekend! Maybe it’s in costume and the blooms are actually supposed to be red! As others said, they don’t bloom at Christmas usually. The need equal hours of dark and light to bloom. I have on that is a cutting from my Mom’s…..and Mom’s is a cutting of my Grandmothers. Your’s is a beautiful color! Without confusion, life would just be boring and dull. THAT’s a cactus! They bloom some pretty flowers! Wow!! My Mom had one of those when we lived in Mass. – they seem to love the weather up there – very pretty, despite it’s seasonal misdirection. Mine too. Never understood why since I bought it blooming at Christmastide. They say different species are timed differently to share the pollinators’ energy over a longer length of time, so you’d think if I bought a xmas one, it’d stick to xmas, wouldn’t cha? Hey – mine are also blooming, for the first time in over 2 years! I about flipped when I saw them budding out. Gorgeous. 🙂 They will bloom when subjected to cooler temperatures, and shorter days.